The government was challenged last week to “make it a priority to respond urgently” to the findings of the independent review of the application of sharia law in England and Wales, published in February. One Muslim lady told me, “I feel betrayed by Britain. I came here to get away from this, and it’s worse here than in the country from which I came”. Therefore, I ask the Minister whether Her Majesty’s Government will make it a priority to respond urgently with appropriate legislation, because many Muslim women are suffering in this country in ways which would make our suffragettes turn in their graves. There are now widespread concerns regarding the nature of consent given prior to sharia council hearings. Women may be pressured by their families into going to these councils and may lack knowledge of both the English language and their rights under English law. Does the Minister agree that this is an issue of equal rights for women? May I press her on how the Government will ensure the rights of Muslim women and ensure that the rule of law is upheld? In assessing the scale of this problem, do Her Majesty’s Government take into account the, I believe, considerable number of people living in closed communities who are under severe pressure, social and otherwise, not to tarnish a family’s ​honour by going to British law and who may not even speak the English language? They are not likely to show on the radar or to give evidence to inquiries. This problem seems to me bigger and more urgent than Her Majesty’s Government are giving it credit for. … require all religious marriages to be legally registered, thereby eradicating the vulnerability of Muslim women in the application of sharia law in this country, whereby a man can divorce his wife merely by saying “I divorce you” three times, and there is widespread polygamy, causing great unhappiness. The independent review also proposed that requiring registration of religious marriages would help to prevent polygamy and discriminatory divorces. A Channel 4 documentary last year highlighted that many Muslim women are unaware that their Islamic marriages are not legally recognised, which means that they have no legal protection if their husband dies or the marriage breaks down. A survey found that 78% of Muslim women wanted their Muslim marriage to be recognised under British law. 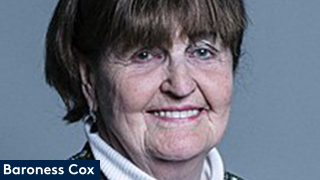 Christian Concern has supported Baroness Cox’s Private Member’s Bill to require registration of religious marriages. We hope that the government acts swiftly to protect women’s rights in this way. Hansard transcript of the debate. Christian Concern: “Sharia councils discriminating against women” – commentary on the independent review into the application of sharia law. Christian Concern: “The Truth About Muslim Marriage” Commentary on the Channel 4 documentary.